You can use sftpman (an SSHFS helper) to mount a remote system - accessible via SSH - to a local folder. sftpman offers both a command-line tool (sftpman) and a GTK frontend (sftpman-gtk, see screenshot), each packaged separately. With sftpman, you first setup (define) your remote filesystems and then you mount/unmount them easily (with one click/command). In order to use sftpman or it's GTK frontend sftpman-gtk, you'll first need to have a working SSHFS setup. The sftpmanAUR and sftpman-gtkAUR packages are available in the AUR. sftpman provides the base library and the command-line application sftpman. 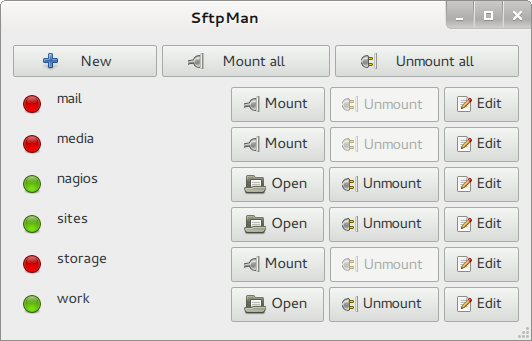 sftpman-gtk provides the sftpman-gtk application, a GTK frontend to sftpman. Each filesystem managed by sftpman needs to have a unique name/id which will be used when managing the system and also in its mount path. A system with an id of my-machine will be mounted locally to /mnt/sshfs/my-machine. Authentication with the remote filesystem during mounting can be performed using passwords or SSH keys. --mount_point "/REMOTE_PATH" --auth_method=publickey --ssh_key "PATH_TO_PRIVATE_KEY"
You can also use the GTK frontend to define new filesystems more easily. Once you've defined several filesystems, you can mount them by using their ids. Note: In order for the GUI application to be able to ask you for a password when mounting, you'll need to install some form of an ssh askpass tool. See SSH keys#x11-ssh-askpass. If the GUI application does not ask you for a password while mounting (when using password-based authentication or for password-protected ssh keys), you will need to install an ssh askpass tool, see #Mounting/Unmounting. Note: If mounting a filesystem fails, sftpman will give you the full sshfs command and its output. You can then use that command and run it manually (possibly after adding some more debug options to it, so you would see some more output). When doing authentication using keys, start small and make sure SSHing actually works by trying it manually, before trying to use sshfs. Some common problems can be solved by consulting Using SSH Keys#Troubleshooting. This page was last edited on 13 March 2019, at 23:34.